Two thoughts came to mind. First, I cherish the string class in .NET. Second, I realize now I never did like Hungarian notation. I also had flashbacks to a code review I did about 4 years ago. Another guy and I sat down to prepare and quickly realized our coding standards were missing something important, specifically, how to deal with strings. Inside of the source file for a single COM component (not much code really) we found all of the following were present: CString, CComBSTR, _bstr_t, _T, LPCTSTR, BSTR, wchar_t, and char *. I’m not sure if I remembered them all, perhaps there was an OLECHAR mixed in there too. In any case, it's nice working with just one simple string class, with the occasional StringBuilder thrown in. Also, I closed a support case with Microsoft recently. There is a bug in the Office 2000 version of OWC and it wouldn’t display all my cube dimensions. More details in this article. There are some good responses to Rory's post with the above title. I like the ThreadPool class because it simplifies spinning off worker tasks, but I did run into one area where I could not use it. All the threads in the ThreadPool CoInitialize into an MTA. If you are doing COM interop with STA components (like any VB6 component), and want to avoid the marshalling overhead, there is no choice but to spin up your own thread with ApartmentState = ApartmentState.STA set before start. Mono 0.30 is now available. It is also encouraging to see some serious effort in porting useful .NET apps to mono, for example, dasBlog. I agree with a recent posts on [mono-list], rebuild the go-mono.net site in ASP.NET to really show it off. 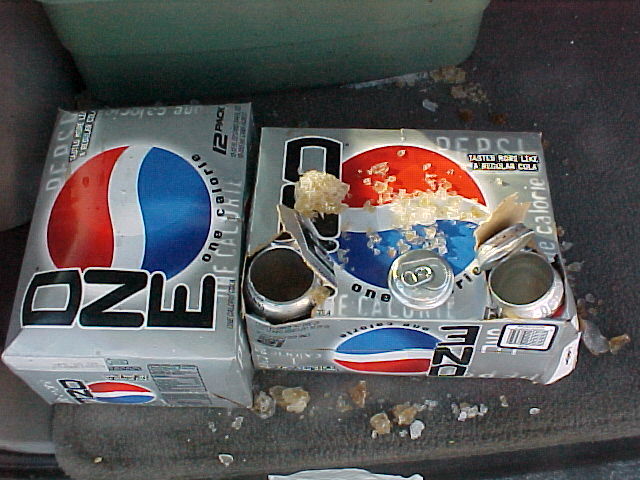 When the temperatures are consistently below 20 degrees Fahrenheit, don't forget to bring the soda in out of the car. The ACM Queue has an interesting article on Building Collaboration into an IDE. The authors have been prototyping a version of Eclipse where IM, source control, screen sharing, and email augment the IDE. The goal is to give you more time to code while you spend less outside the IDE or away from the desk. Another goal is to provide additional context and traceability between code artifacts (source code files) and collaborative artifacts (IMs and emails). I couldn’t stop thinking of questions and ideas while reading, particularly along the lines of how easy it might be to build this with Longhorn technologies. Some things I read I just wish were already in VS.NET, like hovering over a checked-out file will tell you who has the file checked out, instead of just “another user”. It would be nice to put a watch on a file and have the IDE notify me when the other user checks the file in. Being a Visual Source Safe user, it would also be great if the source control product didn’t feel 8 years old. I know MS is working on updating VSS, but I think there is a lot of catching up to do just to make it a solid and trustworthy product. Then I want all the all the bells and whistles and extensible plug-in support.